Optimum Security offers both residential and commercial security guard services in the City of White Rock, British Columbia. We offer highly trained security guards and vigilant mobile patrol security. Our objective is to provide our White Rock clients with the best possible security services by listening to your security concerns; presenting you with the most ideal solution for your specific security needs; and working with local law enforcement to maximise your satisfaction. According to the British Columbia Police Services, there are about 900 property crimes and about 200 violent offences in White Rock. With a population of just under 20,000 people, there is a 5 per cent chance that you or your business could be the victim of a crime in the city. To ensure that you don’t suffer the loss or trauma that results from such crimes, it is best that you take the necessary action to keep yourself, your family, and your property safe. We take pride in being the voice of the White Rock community when it comes to security matters. Our clients are concerned about crime in White Rock, BC, and rely on our professional advice, recommendations, and security solutions for their home and business security. 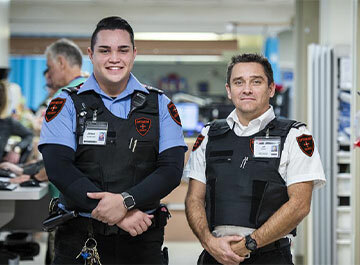 At Optimum Security, we pride ourselves in providing the White Rock community with professional, well trained, licensed, and adequately equipped private security guards. Alternatively, we can provide 24/7 mobile patrol security to inspect and monitor your property. We are driven by excellence, and so our clients can be assured of quality, reliable service 24 hours a day, 365 days a year. Stationing our security guards on-site means that you are guaranteed of the best security response, instantly. With our guards always in uniform, they ensure a high visibility presence to deter any inappropriate or illegal actions. Moreover, our guards offer direct observation through mobile patrols or by monitoring alarm systems and/or video cams. We check for any signs of invasion, disorder, crime, or fire and then take the necessary actions to prevent it while keeping the client updated on all events taking place. We offer residential and commercial security guards and mobile patrol security in White Rock. We deter criminals and intruders from entering your property, helping to protect you, your loved ones, and your possessions. Beyond that, we notify the right emergency services in White Rock when we detect that your property is in danger from fire, floods, criminals, toxic gases, or anything else that might cause harm. Our reputation in White Rock depends on our capacity to deliver the right alarm and security solutions for your home or business, and where needed, select and train outstanding security officers for your specific need, so they function as not only patrolmen, but also an extension of your business. We consistently go above and beyond to ensure that residences and businesses in White Rock are secure and well protected.